It is simply baffling to you how some can comment on the Roman Empire’s brutality. Do they not see the beautiful cities the civil engineers are planning? Do they not see the prosperity and culture all around them? Do they not notice how the residents are what makes the city so productive? Behind all the military glory and great achievements, you are one such civil engineer, and you are determined to make your emperor proud. 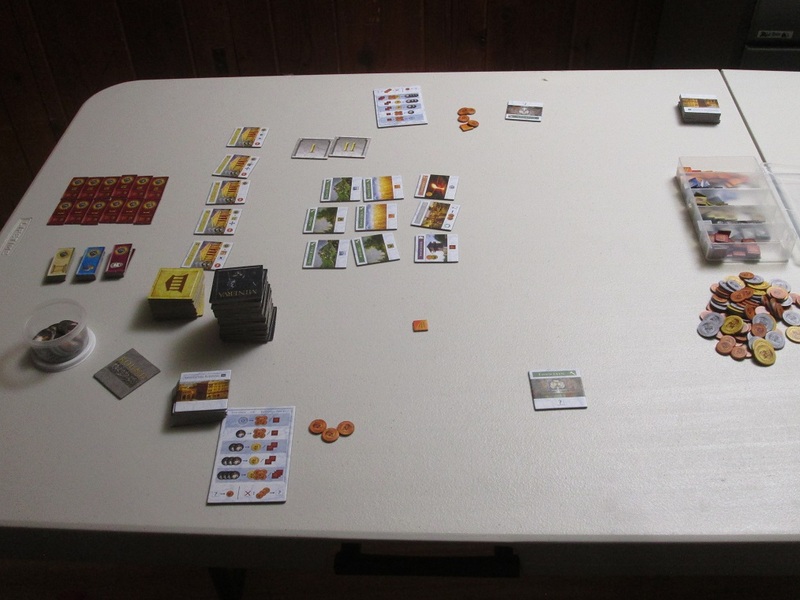 Minerva set up for two players. 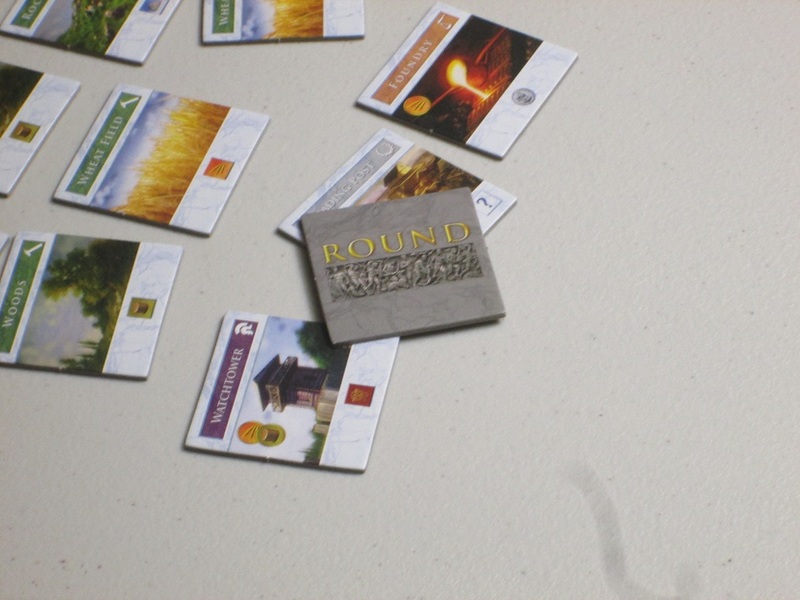 To begin, each player receives a fountain tile, wheat resource, and coins based on seating order. The tile stack is prepared, the start tiles are placed in the market, and new tiles are added until a round tile is revealed. The temple tiles are shuffled and five are laid out, and one turn order tile is put near the play area for each player in the game. On a turn players may either purchase a tile from the market to place in their city, place a residence in their city, place an assistant in an already-placed residence, or pass. Tiles placed in the city must be placed orthogonally adjacent to at least one other tile. When a residence or assistant is placed in the city, the player chooses a direction from that residence or assistant and activates all the tiles in that direction until there is either a blank space or another residence. This player aid doesn’t detail the actions available to players (which are simple enough to remember), but it does give a handy aid to the cost of assistants. There are several tile types that might get activated. Resource buildings produce resources like wheat, lumber, stone, and ore; market buildings produce money, sometimes based on certain criteria; military buildings provide glory; and culture buildings might allow a player to claim the top tile of a culture stack (worth victory points). There are also special tiles, which perform an action only when built, and temple tiles, which are scored at the end of the game and not activated during the game. When a player passes, that player first claims the lowest turn-order tile. Other players may stay in the round, but they must pay 1 coin every time they take a turn. When play order comes back to a player who has already passed, that player collects a coin from the bank. Once all players have passed, players may hire assistants in reverse turn order. Assistants cost an escalating amount of either money or glory. Then, once each player has had an opportunity to hire assistants, players compare the glory they’ve collected and claim glory tiles based on their relative totals. A new round begins, with players adding tiles to the market, and the player who passed first begins the next round. 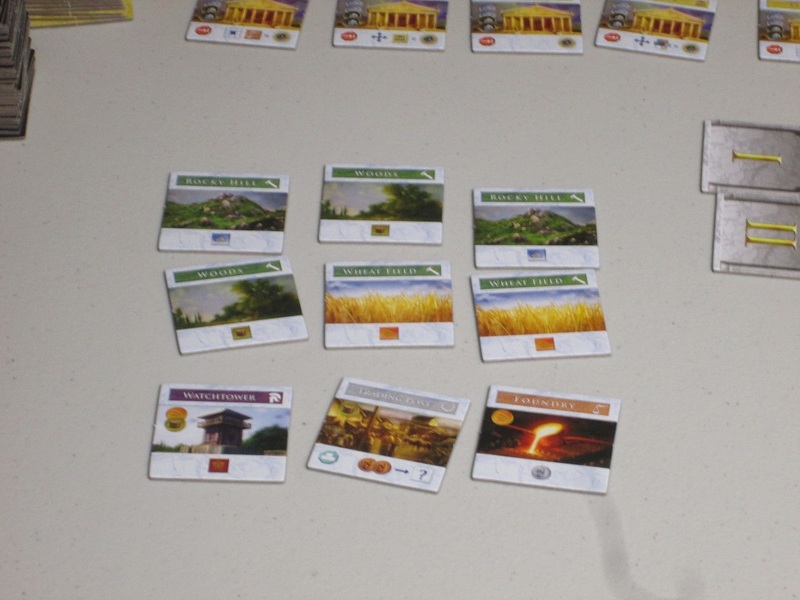 After six rounds, players exchange their remaining coins and resources for points, score based on their passing order in the final round, and add their points from culture and glory tiles and their temples. The player with the most points wins. Tile placement is among my favorite game genres. I love watching an area grow, and I especially love the spatial aspect of getting some benefit based on where a tile is laid. When I first heard about Minerva’s combination of tile-laying and engine-building–and how your engine’s activation is spatial–I was excited. It sounded like it was tailor made for me. Now that the sheen of newness has faded a bit, I would say my initial excitement has been replaced by a modest nod of approval. I like Minerva; I just don’t love it as much as I thought (and hoped) I would. The point tiles in Minerva. These and temples are the main way to score points. There’s still a lot to like, so before I in any way bring down the party, I’ll say that Minerva delivers on its premise: it is a tile-laying game with engine-building, and your engine is activated spatially. This creates lots of fun wrinkles. Because each line in your city can be activated two times (a residence on each end), or up to four at great cost, players are torn between two extremes: build long lines to maximize residence efficiency–you only get nine total over the course of the game–or build a more tightly compact city that is less efficient but offers greater opportunity over the course of the game. 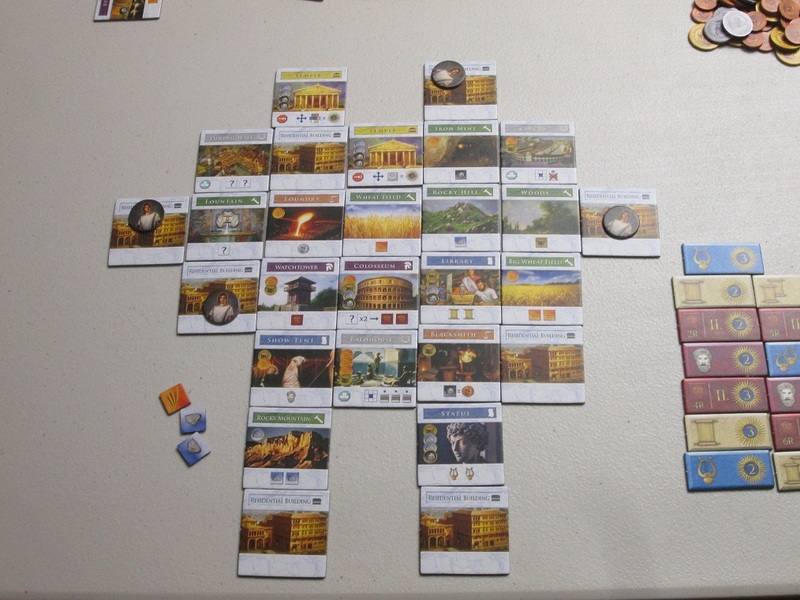 And especially once you consider temples, which in general reward players based on how they’ve built their city, the game’s spatial decisions–the major hook for a tile-laying lover like me–are important and weighty. The tile market at the start of the game. The top six tiles are starting tiles. In the first round, only three tiles were added to the market. The game’s limited resources further hone the puzzle, and because the tile market is shifting and you’re not guaranteed that any tile will come out at a given time, players are torn between strategy and opportunism. Resources are scant: should you save them for a better tile that may or may not come anytime soon? Or should you spend your resources on the tiles that are available and risk disappointment once the next round begins? A bird in the hand, or two in the bush? Should you pass early–ceding the round’s actions to your opponents but costing them money and earning some yourself? Or is this now the time to overclock your city and outdo the competition while they sleep? 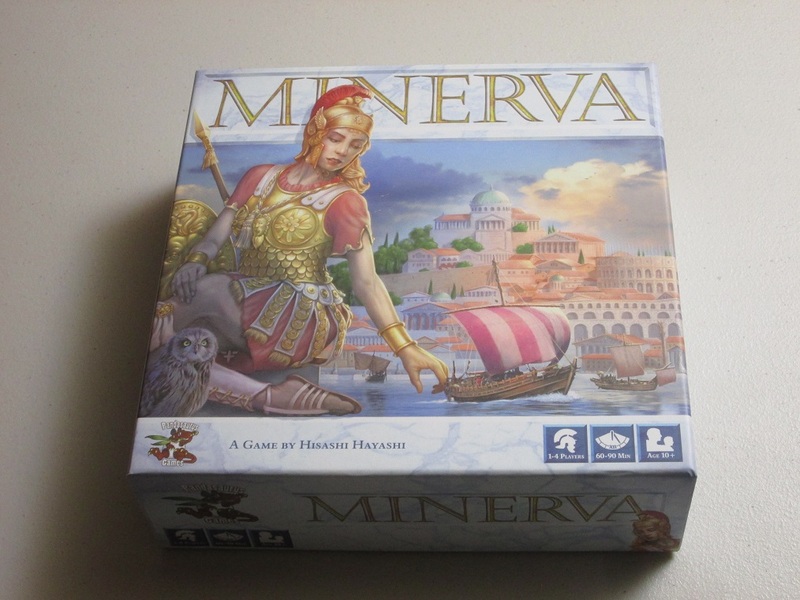 One of the necessary traits of a great game is trade-offs–you can’t do everything you want to in the way or timing you want–and because of the limited resources (both named resources like wheat and wood and the more ethereal resources of opportunity), Minerva has these grueling decisions at every turn. 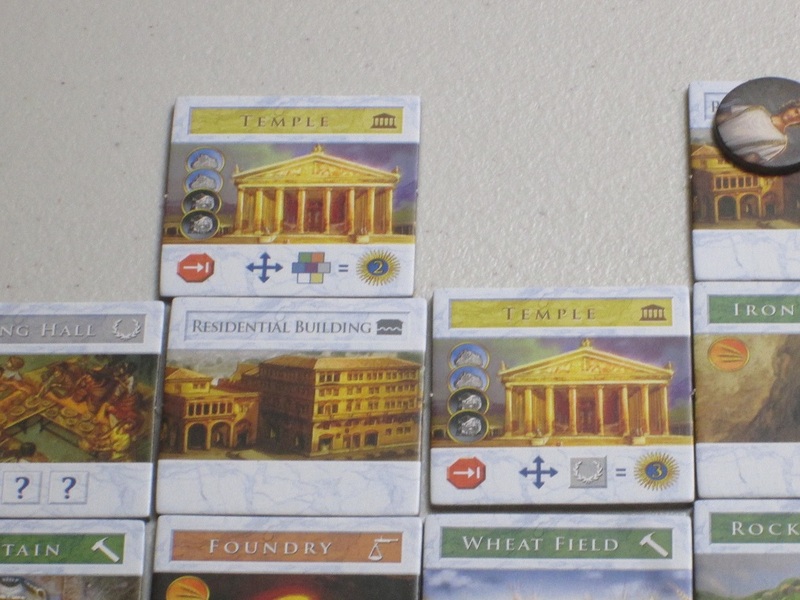 Temples in Minerva score points at the end of the game, often by where they appear in the city and what is either adjacent to them or in the same row or column. While Minerva is somewhat solitary–each player has their own city to manage, and there’s no outright player aggression–the other players at the table will certainly have an effect on what you do. All of the ways to score points, for example, involve some kind of race, whether it’s collecting more glory than the other players or being the first to claim a cultural object. There’s the race with temple tiles: only one player can claim each, and these can provide large bonuses depending on who takes them and where they go. And the tile market is open to all players on a first come, first served basis. Players often have to weigh doing something now against the possibility that an opportunity won’t be there later. All of this to say, while Minerva lacks direct player conflict, I think there’s a good amount of player interaction to keep the game from being multiplayer solitaire. Minerva provides a rigid framework that is at times tough to negotiate, but this tough framework also makes the game especially satisfying when you are able to pull off a clever combo. When you can wring one more activation out of your resource line, or when you can, through resource manipulation, claim the building or temple that you need right before an opponent does, it’s satisfying. From what I’ve wrote, it not only sounds like I should love Minerva; it sounds like I do love Minerva. So why is my enthusiasm dampened? 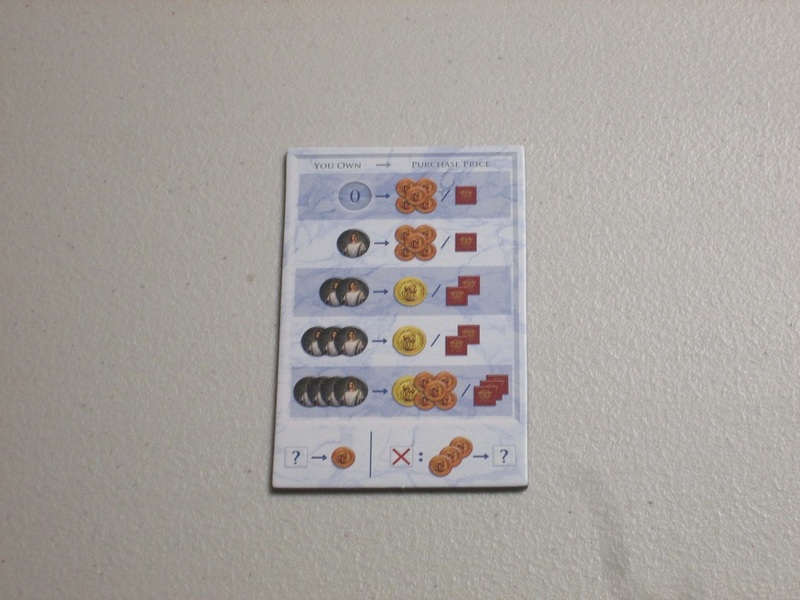 The scoring tokens at the end of a two-player game. Well, there are a few reasons, but I think they all come down to how focused the game is. Now, focus is often a positive trait in a game design, and I think some may even like it here. Essentially, there are three main ways to score points in Minerva–culture, glory, and temples. This keeps the game from point-salad territory, where points are awarded at every turn. It also keeps the game from fiddliness–you aren’t constantly adjusting a score tracker or trying to calculate the mountain of points another player is sitting on. 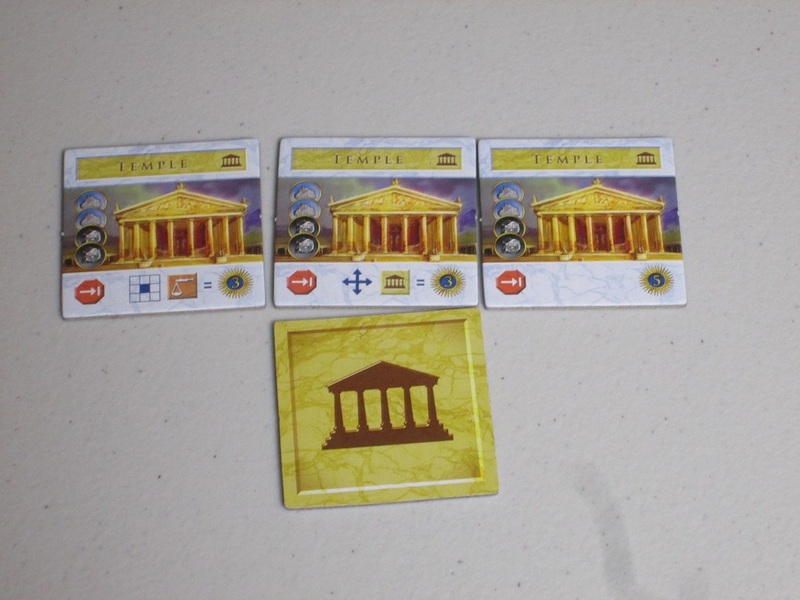 Points are awarded publicly, and with the exception of temples, they are awarded during the game. This focus in the game is what keeps Minerva (most of the time) from bogging down in analysis paralysis: there aren’t that many ways to wring points out of your holdings. Components are clearly marked for higher-player-count games. The round tile indicates when it’s time to stop adding tiles to the market. 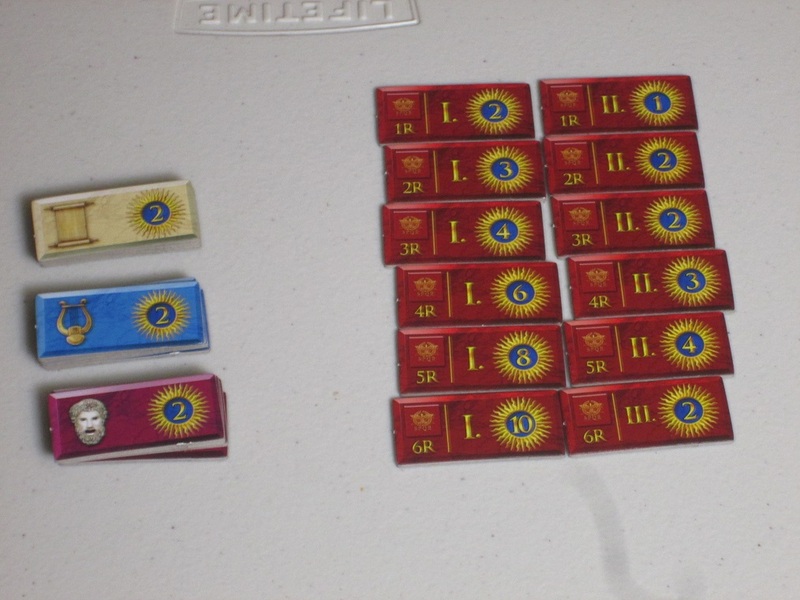 The game tiles are shuffled and divided and six, and one round tile is mixed randomly into each pile. Thus, rounds are often of unequal length. Beyond the clumsiness of when tiles come out, there’s also something unsatisfying in the random lengths of rounds. Essentially, the tiles are divided into six stacks with one round tile shuffled into each, and at the start of the round you place tiles in the market until you hit one. Ideally, this means roughly equal rounds without certainty of what or how many tiles will join the market. Effectively, this can mean uneven rounds where just one or two tiles are added or rounds where there is a tile bonanza and the market is flooded. You never know what you’re going to get. I suppose this could be just something to be aware of in the game, rather than a negative, but the unevenness has happened in several games, and it has been an annoyance to me and the other players each time. In fact, most of the things that I find unsatisfying or odd about Minerva might endear it to someone else. One person’s “you can’t plan ahead!” is another person’s “I love tactical decision making!” I don’t mind games that require on-the-fly adaptation, but I do prefer it when there’s at least some knowledge of what to plan for. For the weight of the decisions that players make, Minerva offers a little less control than I like. These temples are scoring points based on where they were placed. Essentially, I love probably 70% of Minerva and dislike 30%, which explains why my opinion is a tepid “I’m positively inclined toward it” rather than enthusiastic shouts to buy it while you still can. I think no small part of the problem, for me, is that Minerva’s flaws are thrown into stark relief by another recent release, Santa Maria, which has similar tile placement and spatial engine activation but with more options to mitigate forces outside the players’ control. I played Santa Maria first, so I found Minerva’s strictures confining. A finished city in Minerva. However, I recognize this is a matter of taste. I like Agricola, but some people love it, and the kind of people who enjoy the feeling of being constantly behind the eight ball will appreciate Minerva’s tight economy and focused options. Minerva also plays faster and is less of a brain burner than Santa Maria; I taught a new player and finished a two-player game within an hour. The rules are simple and the few ways to score points make the game easier to explain and grasp. So while I prefer Santa Maria, that’s not to say that Minerva won’t have its fans. The tile backs in Minerva. Mine started showing wear almost immediately. The components for Minerva are by turns excellent and just okay. The cover of the box and the white marble effect is stunning, yet the cartoony (and large) Pandasaurus logo that appears on every side of the box seems like a mismatch from the lavish look the game is going for. Franz Vohwinkel’s art adorns the tiles, and they look great; the tile backs, however, are a very dark blue marble, and even after a few plays, they were showing wear. I don’t think this is a huge problem–I doubt anyone will be looking at marked tile backs for clues to what’s coming next–but the tiles are likely to wear unevenly. 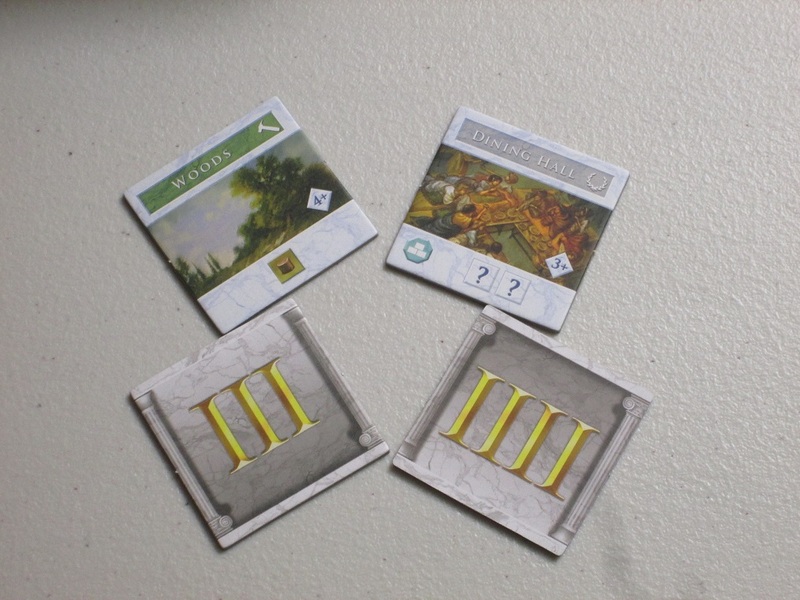 The round tiles and tiles for one or two players are used in every game, whereas other tiles are only used in three- or four-player games. 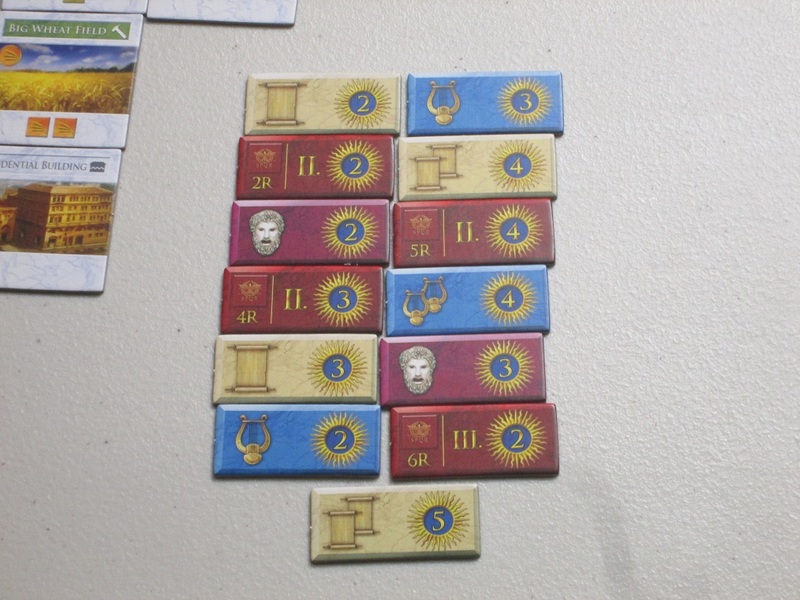 The tiles are on thick stock, which is great, but I’m not a fan of the resource pieces, which are small square tokens. They work, I suppose, but they’re hard to pick up and feel a little paltry during the game. 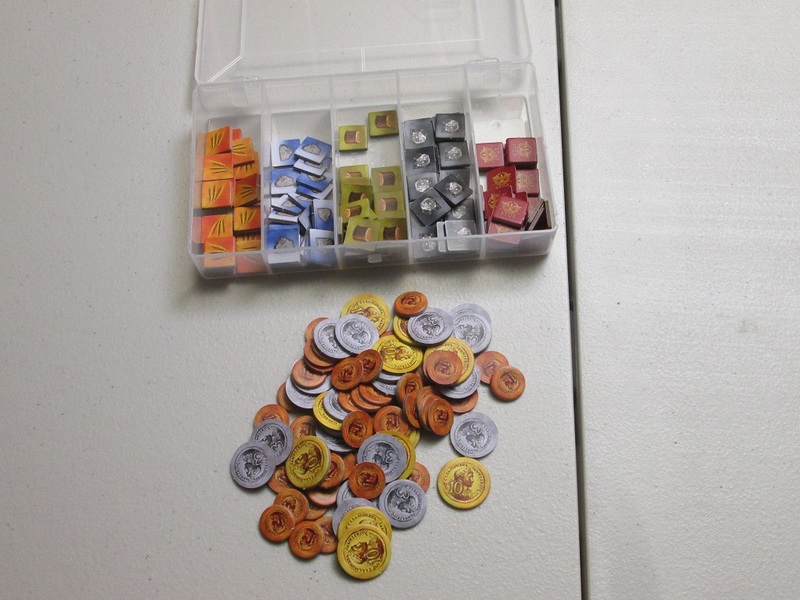 The coins, assistants, and point tokens are all larger tokens, and these work fine. There are a few aspects of the production that, while not necessarily game breaking, are a bit annoying. The rulebook is littered with errant hyphens and uses different terms/symbols (holdovers from the earlier edition, perhaps?) that don’t match the current production. There are placeholder words where icons should be. At least one sentence appears nowhere near the paragraph where it’s supposed to be. These things are easy enough to figure out, especially given the simple rules, but these snafus bring down an otherwise nice production. The Pandasaurus logo–on every visible surface of the game box–is a stark contrast to the elegant look of the rest of the game. I’ve played Minerva with one, two, and three players, and I liked it best with two. In fact, I think two is the player count where I’m most likely to play Minerva in the future. It’s quick and punchy when it’s your turn more often, and when the game moves that quickly, it’s easier to overlook some of the annoyances I mentioned earlier. The three-player game was fine, and I’d play at that count in the future (especially if players are familiar with the game), but it didn’t encourage me to want to play the four-player game. Minerva is at its best when there’s very little downtime. The decisions matter in the game, but they aren’t so weighty that there’s a lot to consider when it isn’t your turn. I should also mention that because this is a “take actions until you can’t” kind of game, it can tend to bog down in the final round, when each player is trying to maximize their points. This is another argument in favor of a smaller player count, perhaps. The solitaire game is an interesting puzzle, but I probably wouldn’t buy this if I were planning to play this exclusively as a solitaire game. It’s definitely better when there are other players to spar with. 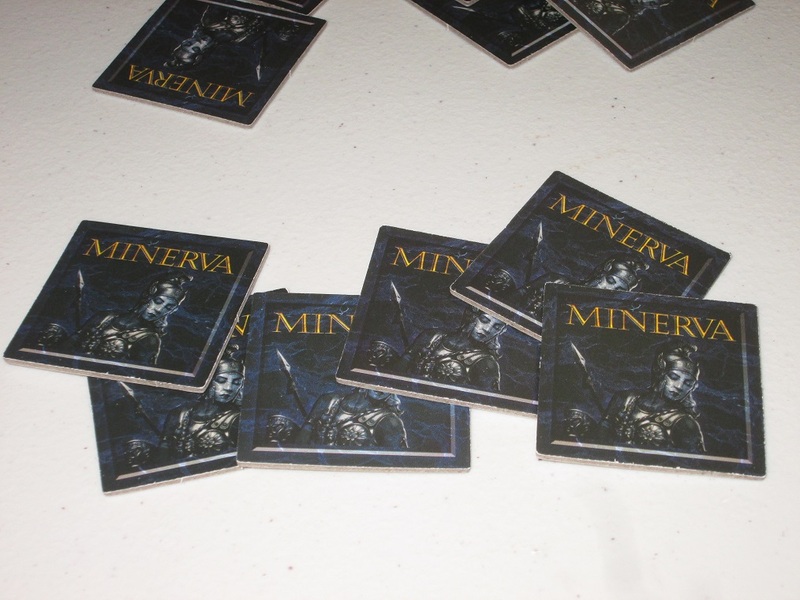 Minerva is a decent tile-laying game with a great hook–where you place your tiles determines the order in which they activate. And as I said, it mostly lives up to its promise. Fans of quick and brutal strategy games will get a kick out of Minerva. While it feels a little unpolished next to a game like Santa Maria, it’s still a good game in its own right and one I wouldn’t refuse to play if someone else suggested it. And I might even suggest it myself as a satisfying two-player lunch game. 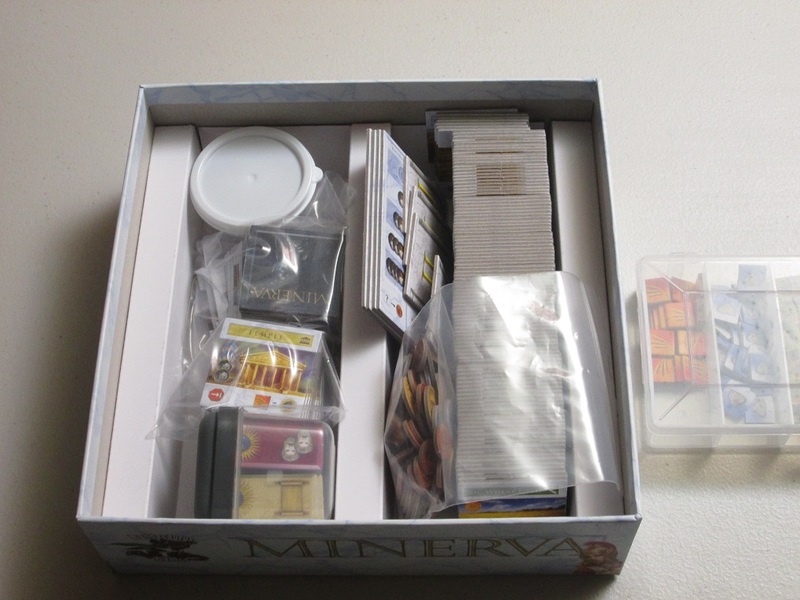 iSlaytheDragon would like to thank Pandasaurus Games for providing us with a copy of Minerva for review.